Here's me and Lucas (freshly shorn) heading back to the car after landing in Seattle. 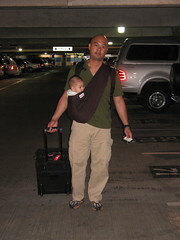 Not only am I lugging the son, but I'm also towing a suitcase and a backpack stuffed with a laptop. Been catching up with life-stuff. You should've seen how overgrown the lawn was. I'm in Get-Your-House-In-Order mode: landscaping, responding to e-mails, sending out mail, etc., so if you've e-mailed me and I haven't gotten back to you, you're probably next on my e-mail reply list. I haven't seen Dark Knight. :-( Maybe this week?